Hello dear ones, I swear I'm still cooking and eating. Just not blogging. Sad really, because I have no excuse. Whisk dressing ingredients together, pour over salad. Taste and adjust seasonings. Chill salad and enjoy. Place rhubarb, apples, 1/2 cup sugar, crystallized ginger, and 2 tablespoons flour in a large bowl and toss well. Combine “crisp” ingredients in a bowl and mix with a pastry blender or fork until crumbly. Spread about 1/3 of the crisp mixture on the bottom of a greased baking dish. Place the apple rhubarb mixture on top of the crisp mixture. And spread the rest of the crisp mixture on top of the apple rhubarb mixture. Bake at 350F for 30+ minutes, until fruit is tender and topping is browned. Both dishes look so refreshing and delicious! I have most of the ingredients on hand so who knows, maybe I'll make 'em. 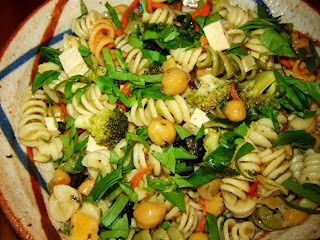 Between that pasta salad and the crisp, my mouth is watering - your recipes are always enticing! I love rhubarb in any form! Thanks for posting the recipe. 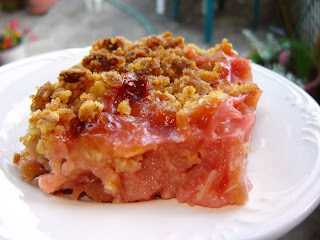 Your rhubarb ginger apple crisp sounds amazing! Thanks for the recipe! Mmmm...rhubarb! I love to eat desserts with rhubarb, but I've never cooked it myself. I should try your recipe b/c it sounds delightful! Of course I love the salad with broccoli and chickpeas, and the dessert is just beautiful!